In this Part we will explore the meaning of the 38th Shloka of Sri Vishnu Sahasranamam. Sri Adi Sankara explains this as ‘Padmasya Naabhau Madhye Karnikaayaam Sthitah iti Padmanaabhah – He is situated in the middle of one’s heart that is shaped like a Lotus’. Our heart is is popularly known as ‘Hridaya Padmam’ or ‘Hritpadmam’ meaning Lotus like. Bhagavan is positioned in the middle of that Lotus or in the navel of that Lotus and hence He is called Padmanaabhah. Meaning: Bhagavan should be contemplated as seated in the middle of our hearts with his four hands and crystal like brilliance and perfect purity’. Sri Parasara Bhattar gives the meaning that his navel is beautiful like a Lotus. Thaamarai undit tanip peru naayagan – ThiruvAshiriyam. Sri Satyadevo Vashishtha gives a very different explanation from other commentators for this Nama. He interprets Padma as “flower” or something that displays colorfully, and Nabh as something that does not express itself as brilliantly. Thus, he interprets Padma-nabha as one who is at two extremes at the same time. He is the knowledge in the learned and the lack of knowledge in the not-learned; the one who reveals Himself to His devotees and hides Himself from the non-devotees, like the Lotus that blossoms in the presence of the Sun and the same Lotus that folds its petals when the Sun disappears. The other interpretations include One who resides in the centre of the heart Lotus of every one, and One from whose navel, the Universe sprung forth in the form of an eight-petalled Lotus with the Meru Mountain as the tip, have been explained previously. Sri Adi Sankara defines this name as ‘Aravinda sadrishe Aksheeni asya iti Aravindaakshah – His eyes are lovely like the Lotus flower hence He is called Aravindaakshah’. In the Dhyana Shloka 4 we have seen him as ‘Pundararikaayataaksham – One with eyes large as Lotus’. Earlier in the Nama 40 we have ‘Pushkaraakshah’ which has a similar meaning. Swami ChinmayAnanda brings the similarity to the Lotus in that His eyes open to His devotees (like a beaming rays of the bright Sun), and closes to the non-devotees (when it gets dark). Sri Satyadevo Vasishtha derives the meaning from the word “ar” which means gati, and vindati – praapnoti or One who has, and thus gives the meaning “Chandra and Surya” to Aravinda. Thus He derives the meaning “One who has Chandra and Surya as His two eyes” for the Nama Aravindaaksha (‘ChandraSuryau cha Netre’ as in Dhyana Shloka 2). The meaning very similar to that of Pundarikaakshah – Nama 40. 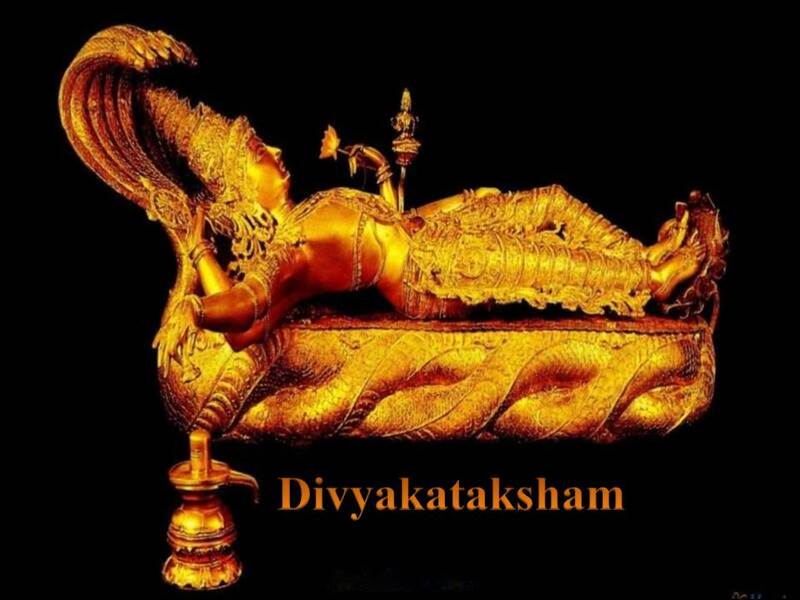 Sri Adi Shankara says ‘Padmasya Hridayaakhyasya madhye Karnikaayaam Sthitah – He is fit to be worshipped in the middle of the heart-Lotus and so He is called Padmagarbhah’. Here Padmakosha-prateekaasham means someone who has to be meditated on at the centre of our heart-Lotus and is an elaboration of Padmagarbhah. Sri Ramanujan gives reference to (Thiruvai Mozhi 4-5-8) – Tandaamarai Sumakkum Paadap-Perumaan referring to his Lotus feet that bears his body. He is meditated upon as being seated on a Lotus abounding in fragrance and elegance. The words – “Sarasijaasana sannivishtah” is very familiar. Mundaka Upanishad says ‘Daharam vipaapmam para-veshmabhootam yat-pundareekam – He is seated on The Lotus (i.e., heart) which is subtle, flawless, and the seat of the Supreme Being’. Sri Adi Sankara gives two alternative interpretations for this Nama. The first interpretation is ‘Poshayan Annaroopena Praanaroopena vaa Shareerinaam Shareeraani Dhaarayati iti Shareerabhrit – He protects all the beings in this Universe through food and life-energy, hence He is called Shareerabhrit’. The second meaning is ‘Svamaayayaa Shareeraani bibharti iti Shareerabhrit – With his power of illusion or Maya he carries various forms in his different incarnations hence He is Shareerabhrit’. Here he is referring to the fact Bhagavan carries various bodies such as Fish, Turtle, Boar, Lion and Human form in his different incarnations using his power of VishnuMaya. Sri Parasara Bhattar says that He is the sustainer of the bodies of those who meditate on Him, since it is His Guna on which they meditate that sustains them. Sva-SaarIra-bhutam upaasakam pushnaati iti Sarira-bhrit – He considers their bodies as His, and protects them. Sri Radhakrishna Shastri supports the second interpretation by saying that He supports (bears) different bodies in different incarnations for the protection of Dharma and elimination of Adharma. Sri Adi Sankara interprets this Nama as ‘Mahati Riddhih Vibhutih asya iti Maharddhih – He has a magnificent opulence or prosperity, hence He is called Maharddhih’. His opulence is fully described in Chapter 10 of the Bhagavad Gita which is in fact appropriately called Vibhuti Yoga. Sri Parasara Bhattar paraphrases this name as ‘Tad-yogakshema nisseema vibhootih – He has boundless riches which can bring about the well-being and protection of His devotees’. Swami ChinmayAnanda points out that Riddhi refers to the combination of prosperity and power. Sri V.V. Ramanujan gives the reference from the Divya Prabhandam – Veetrirundu Ezh ulagum tanik-kol Sella Alum Ammaan (4.5.1) – One who rules over the Seven Worlds. The Dharma Chakram writer points out that wealth are of two kinds – the material wealth (Porul Selvam) and the wealth of benevolence and Mercy (Arul Selvam). Material wealth can be found both in the good and bad; but the wealth of kindness and benevolence is found only in the good. Bhagavan is full of both kinds of wealth, and so He is Maharddhih. Those who meditate on Bhagavan’s Nama of Maharddhih will be blessed with both these kinds of wealth. 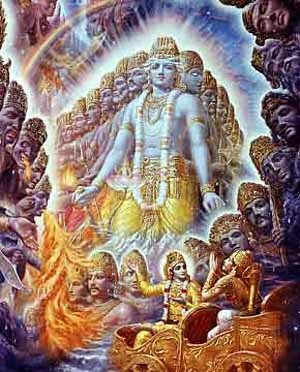 Brahma looked surprised while Indra frowned asking, ‘Of all the people in the celestial worlds, why do you think that mortal is your best devotee?’ Lord Vishnu smiled and said, ‘because of his deep sense of devotion and his sense of Dharma. Lord Vishnu further added ‘I have no doubt that he is one of my best devotees, Brahma, Indra and the other Devas took leave from Lord Vishnu. As they were returning to Amaravathi, Indra spoke, ‘Rantideva? 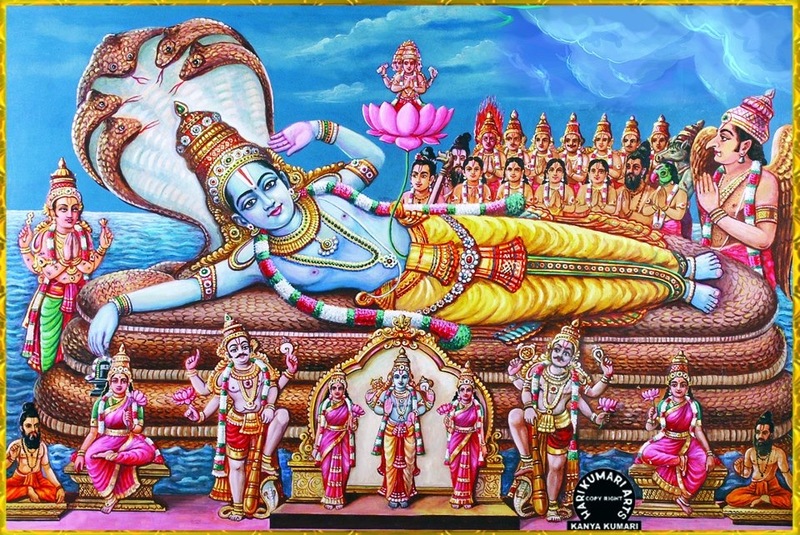 Do you really think Lord Vishnu was right in thinking that a mere human would be his best devotee, when there are countless Devas and Gandharvas, who are so devoted to him?’ Vayu also nodded his head, ‘I do not agree that a mere human being can ever be so devout, anyways what do humans know about devotion? Vayu said contemptuously. Varuna nodded his head, ‘I think we should test this man Rantideva.’ The Devas agreed to test Rantideva. 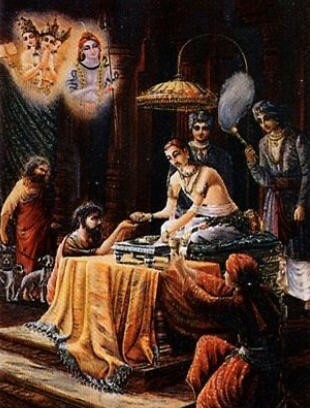 King Rantideva was a kind hearted and was a great devotee of Sri Hari. He was very generous and worked hard for the good of his subjects. He showed no differences and embraced all the people of his kingdom alike for he saw Lord Hari in every living creature. The King was very clear that Sri Hari had given him the wealth and richness in plenty for a purpose to serve and help people in need. He considered himself to be an instrument made by Lord Sri Hari to share and distribute his blessings to the all. Thus his fame was known far and wide. Unfortunately one year, there was a big famine in his kingdom that led to the failure of crops, death of the cattle and because of this men, women and children starved in large numbers. So they turned to their King helplessly. The King distributed to his subjects with whatever he was left with. He used to sit and pray to Sri Hari to give him the strength to remove their suffering. But the condition worsened day by day and the famine continued. As situation got worse there was a time when the King himself did not have anything to eat. He was unable to feed his own family. Nevertheless, Rantideva used to feel happy, because his mind was satisfied when his people were fed. As the drought was getting severe, the King was left with nothing to give his hungry and starving subjects. But his faith in Lord Sri Hari grew stronger by the day. Rantideva could not bear the misfortune of his people. 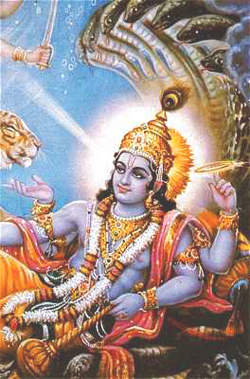 He decided that only Lord Vishnu could protect him now. He began to meditate deeply on Lord Vishnu to protect his people. Forty-eight days he meditated on the great Lord. Rantideva’s ministers looked at the shrivelled and pathetically thin King and were deeply concerned about him. They convinced him to break his fast on the forty eighth day. With great reluctance, Rantieva agreed. The Ministers and their family members provided the King with some gruel and water. When the King and his family were about to eat the gruel, there came a very old and frail looking Brahman to their doorstep who was in much need of food. The King received him respectfully and gave him a portion of the gruel to eat. The Brahmin ate and went happily after thanking the King. They were about to sit down to eat again, just then a pale hungry beggar came to him for food. So Rantideva gave him a portion of the meal to eat. 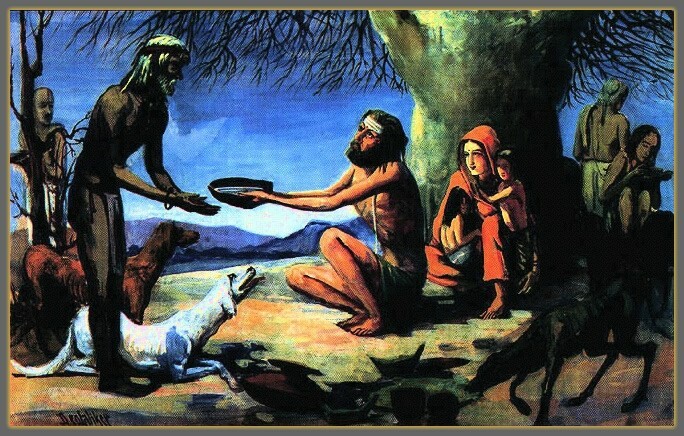 Then soon after the beggar left, then came a sweeper with his lame dog whose sight was very pitiable, he said in a weak voice that he and his dog had not seen food for more than a month and that they have come to him for help as a last resort. So the King gave him the remaining gruel. Once the man drank the water and his thirst was quenched, his eyes opened with a sparkle and were full of life. But to everyone’s surprise though it was the Chandala who had water, it was Rantideva who felt refreshed and fulfilled, just as a hungry man feels after a good sumptuous meal. In a flash there appeared before him the Great Lord Vishnu, his consort Goddess Lakshmi with Lord Brahma, the Devas and the Pancha Bhoothas’. The king was dumbfounded as he saw his Great Lord with his consort, Lord Brahma, Indra and the other Devas. Rantideva looked at Lord Vishnu and the Devas as he bowed to them, his eyes were filled with tears of bliss and his voice choked. Lord Vishnu spoke thus, ‘You have understood my creation in a way that no one ever has, for this I grant you Moksha.’ Rantideva felt spellbound and overwhelmed. His great Lord had come to make him a part of the Lord Himself. Lord Vishnu spoke, ‘don’t you worry about your people. Everything will be back to normal and your people would always be happy and prosperous.’ Rantideva smiled as he merged with Lord Vishnu attaining Moksha. We have already seen this Nama in Sahasranamam as Nama 279. The meaning assigned earlier by Adi Sankara was ‘One who is richly endowed with the qualities of Dharma, Knowledge and Renunciation’. Now Sankara interprets this as ‘Prapancha roopena Vartamaanatvaat Riddhah – He is in the expansive form of the Universe hence He is called Riddhah’. This meaning is derived from the root word of ‘Riddh’, which means ‘to expand’. He grows when His devotees grow. This idea we have seen in 2 earlier names Vardhanah (261) and Vardhamaanah (262). We have seen how Bhagavan grows from a diminutive ‘Vamana’ form to the gigantic ‘Trivikrama’ form or in his Matsya Avatar He grows from being a small fish to a Giant one. He grows when His devotees grow. He crowned Vibheeshana and as a result He became happy and void of any worry; so He grows happy when His devotees grow. The Dharma Chakram writer points out that He grows beyond the reach of the knowledge of beings. It is only by meditating on His sterling qualities can one reach Him. Thus He is Rddhah. Vriddha means old. Since, He is the oldest or the most ancient Self or Atma, He is called VriddhAtma. This is very similar to the Nama Jyeshtah (Nama 68). Sri Adi Sankara interprets this Nama as ‘Puraatana Aatmaa yasya iti Vriddhaatmaa – He is ancient, primordial and beyond the reach of history and hence called Vriddhaatmaa’. We are going to see a similar name ‘Puraatanah’ later in the Sahasranamam. Meaning: One should meditate upon the Supreme Person as who knows everything, who is the oldest, who is the controller, who is smaller than the smallest, who is the maintainer of everything, who is beyond all material conception, who is inconceivable, and who is luminous like the Sun and, being transcendental, is beyond this material nature and exists eternally’. Bhagavan was the Self before all creation and He does not have the cycle of birth, growth, old age and death, which all normal beings have to go through. A natural growth cycle for human beings is described by the Dharma Chakram writer. A cycle of this in Samsara starts from the womb, being born, growing up to be a child, adolescence, adulthood, an older person, and IF the person meditates on Bhagavan, leads a life of Dharma and surrenders to the Lord, at the time of death, the person attains Moksha. This last stage is the culmination of the cycle. Meaning: Om, That (Brahman) is Whole, This (Universe) is Whole; from the Whole, the Whole becomes manifest. From the Whole, when the Whole is negated, what remains is Whole (Brahman) alone! Om Peace! Peace! Peace! Bhagavan was in the full-grown state before anything existed, without going through this cycle, and so He is VriddhAtma. He was the Self before all Creation. Sri Adi Sankara defines this as ‘Mahatee Akshinee Mahaantyaksheeni vaa asya iti Mahaakshah – He has great eyes hence He is called Mahaakshah’. This can also be interpreted as someone having innumerable eyes. Aksha also means an axle. Sri Parasara Bhattar interprets this to refer to a chariot, by means of a figure of speech where a part is used to refer to the whole. So Mahaakshah means One who has a vehicle worthy of reverence. This vehicle is Garuda the celestial bird, the embodiment of Vedas. 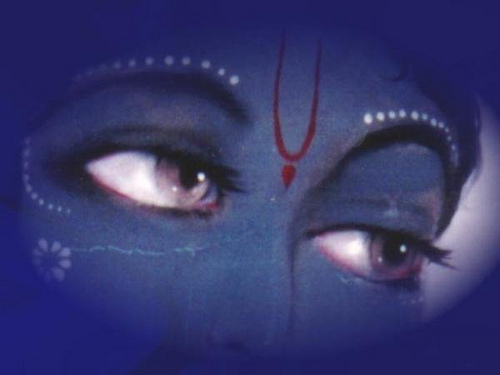 According to Swami ChinmayAnanda, Bhagavan’s eyes are great because they can see not only the external objects, but can also see through everything, everywhere, inside and outside without exception and nothing is hidden from them. His eyes see through all that is happening deep within the bosom of all creatures. Sri Satyadevo Vashishtha uses the meaning “one who leads” to the word Aksha (this is also related to the meaning axle or vehicle), or one that helps in moving. So Mahakshah is one who shows the path to everyone. The Dharma Chakram writer points out that the Greatness of His Eyes refers to their power to remove the darkness of ignorance when they fall on His devotee. Meditating on this Nama of MahaVishnu will give the ability to see things with the eye of detachment and love rather than with the eye of desire and greed, and removing ignorance from the eyes of His devotees. Sri Adi Sankara says ‘Garudaanko dhvajo yasya iti Garudadhvajah – He has the symbol of the celestial bird Garuda on his flag hence He is called Garudadhvajah’. 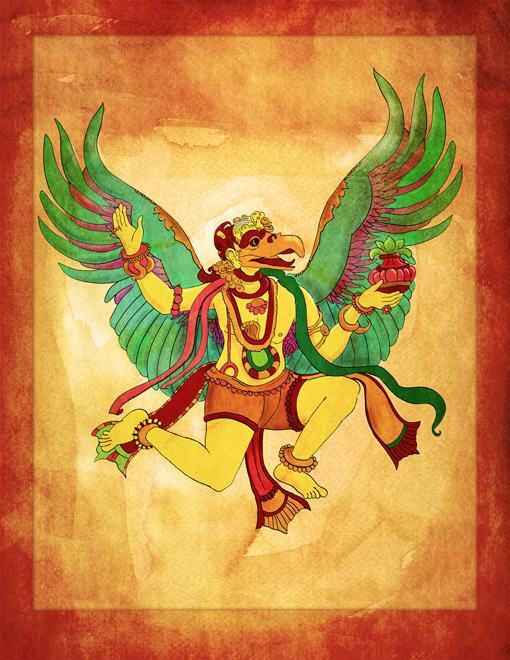 Garuda, in addition to being His Vehicle or Vaahana, is symbolized on his flag as well. Garuda has five vyuhas – Satyan, Suparnan, Garudan, Darkshyan and Vihakeshvaran. They act as the Devas for the body’s five wind elements of Prana, Apana, Vyana, Samana and Udana. In Ramayana, when Rama and Lakshmana were breathless and injured by Nagapash Astra of Indrajit (trapped by snakes), they were rescued by Garuda who appeared at the behest of Hanuman at service of the Lord. Garuda’s presence scared away the snakes. Swami ChinmayAnanda points out that the eagle soars high in the sky and can see even the minutest object on the ground and purifies the land by removing the impurities such as the carrion etc. Similarly, the Lord never allows any negative thoughts in the heart of His devotees, and hence the eagle is considered as His symbol. Sri Radhakrishna Shastri refers to Mahabharatam where Garuda requested Sriman Narayana for His permission to stand on top of Him when Garuda had to fetch nectar for securing the release of its mother. Bhagavan made him His banner to grant this request. In return He also requested Garuda to be His vehicle. This is how Garuda is both the flag and the vehicle being the flag at Garuda’s request and being a carrier at Bhagavan’s request. Sri Satyadevo Vashishtha points to the powerful eagle moving fast while removing the poisonous serpents at sight, similar to Bhagavan removing the sins of His devotees. The Dharma Chakram writer points out that Garuda being the Vaahana for Bhagavan symbolizes that the JivAtma exists for the service of the ParamAtma. He is Padmanaabhah as He has Lotus emanating from his navel. He is situated in the middle of one’s heart that is shaped like a Lotus. His eyes are lovely like the Lotus flower hence He is called Aravindaakshah. He is to be meditated from the centre of our heart-Lotus and hence He is Padmagarbhah. He protects all the beings in this Universe through food and life-energy, hence He is called Shareerabhrit. He is Maharddhih as He has a magnificent opulence and prosperity. He grows to the most expansive form of the Universe hence He is called Riddhah. Vriddha means old. 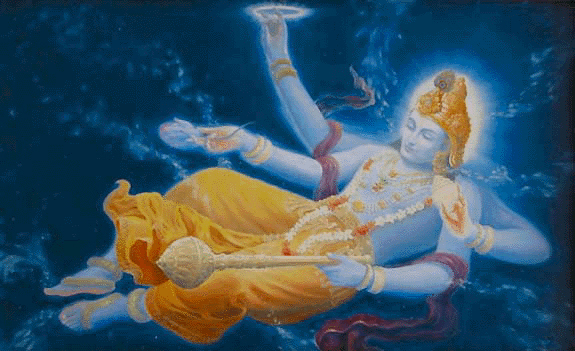 Since, He is the oldest or the most ancient Self or Atma, He is called VriddhAtma. He has great eyes hence He is called Mahaakshah. 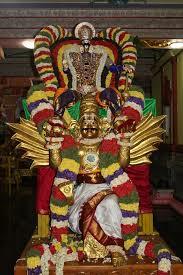 He has Garuda as his Vehicle as well as the symbol of the Garuda on his flag, hence He is called Garudadhvajah. learnt a lot from this shloka ..padmanabha meaning two extremes, chandala meaning a person who disposes corpses (never thought of it this way !) , the story of rantideva and why the eagle is His symbol… truly wonderful and keep it going!! Thank you sir for the divine narration. Beautiful shlokas and references used. Tamil and sanskrit. Great job! Hari Om Uncle! Beautiful story of Rantideva, never heard of him before. He is indeed a great devotee, if it was me I would go hide and eat before anyone see’s me. We have to learn a lot from such stories. I liked the nama of Aravindaakshah and his beautiful image there. 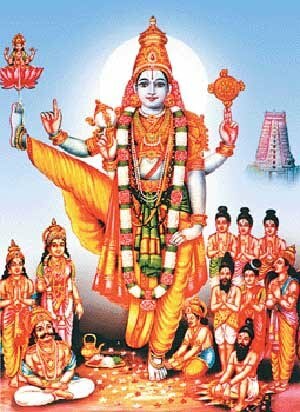 Somehow in all namas we see more of the dashavatharam forms of his different avathars, I liked that too which is always fresh and vivid in my mind. Thank you both Uncle! You are so funny (and honest) 🙂 Most of us would probably be behaving like what you say. We generally focus on self preservation and in fact even in aircraft safety announcement they ask you to put your oxygen mask first in case of fall in cabin pressure before helping even your own child! But when one becomes an enlightened person, their ability draw from their inner strength to sustain is very high. They can withstand and draw from the power of their meditation. You will see in different sections of the Shlokas his different forms being glorified. It becomes easy for us to appreciate it when we associate this with a story. Hence, my attempt is to always narrate an appropriate story to bring a vivid explanation that can helps us to absorb this easily. Glad to note that you are regularly following this and raising some very interesting questions! HARI OM! The story is fantastic and the incident of Garuda being his vehicle and on his flag is interesting. About the flag I was not even aware of. We are ignorant of many of these facts because of our convent education. Your involvement in answering queries also shows how passionate you both are. Simply Great! Good day!